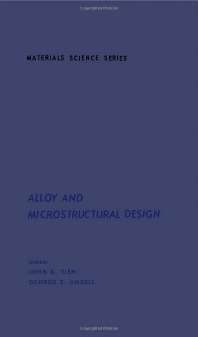 Alloy and Microstructural Design serves as a guide in translating theory into design and practice and provides text for an applications courses in physical and mechanical metallurgy. Coverage of the book includes a short history and introduction to metals and alloys; high-strength nonferrous alloys; and methods in strengthening metals for commercial use and high temperatures. The text also discusses the composite strengthening; the properties of composites; creep and stress rupture resistance and other factors related to them; fracture toughness; and mechanical equations of state. The book also covers the resistance of metals and alloys against fatigue, aqueous, stress, and hot corrosion, as well as in oxidation and hydrogen embrittlement. The monograph is recommended for practicing engineers in the field of metallurgy who need an easily understood guide with concise text and tables of handy information. The book will also serve as a good learning material for engineering undergraduates who are studying the strength of materials. II. What Is Engineering Creep?